Disney’s new blockbuster has its origins at an office at Monroe and Wacker, where failed businessman and pencil-sharpener-agent Edgar Rice Burroughs churned out the serialized tale A Princess From Mars in order to put food on the table. It’s a sentence worthy of Poe or García Márquez: “I do not know why I should fear death, I who have died twice and am still alive.” Actually, the line came from the pen of a Chicagoan, Edgar Rice Burroughs. It appears in the first paragraph of his A Princess From Mars, the novel that’s the foundation for the new Disney movie, John Carter, due out March 9. Encouraged by an editor, Burroughs sent the tale to The All-Story, a pulp magazine, where it was serialized, beginning in February 1912, as “Under the Moons of Mars.” But his excitement over the publication of his first story—and his $400 fee—was diminished by a typo. To signal that he was no addle-brained fabulist, Burroughs had submitted the tale under the name “Normal Bean.” But an overzealous proofreader had changed “Normal” to “Norman,” and Burroughs decided to abandon the nom de plume. After appearing in All-Story, the Martian tale briefly disappeared. So did the pencil-sharpener company. Burroughs worked briefly for a stationer on West Kinzie Street, and then he took a job with the business magazine System, which had offices at Wabash Avenue and West Madison Street. There, in December 1911, he began writing another improbable tale, the story of an orphaned baby—John Clayton, Lord Greystoke—who is reared in Africa by a tribe of apes and grows up to become a superhuman jungle hero. 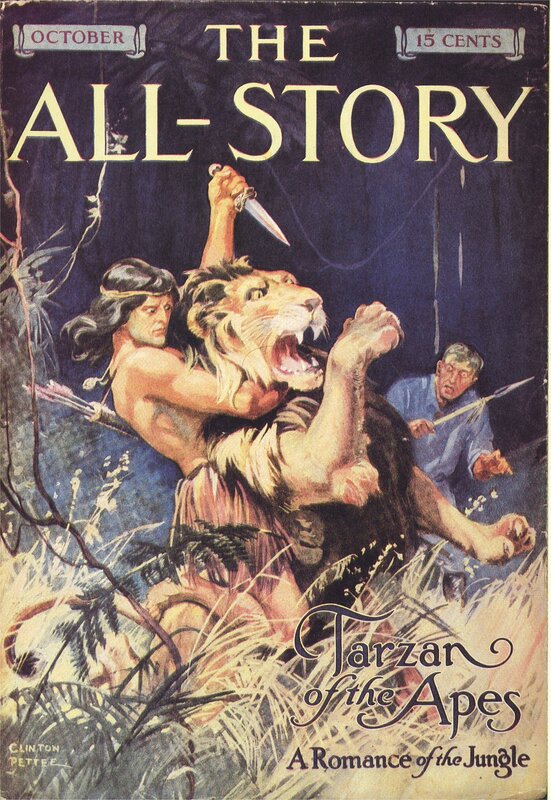 Appearing in All-Story beginning in October 1912, Tarzan of the Apes would make its author famous and wealthy. Looking to capitalize on his growing popularity, the Chicago publisher A. C. McClurg began putting out Burroughs’s serialized novels in book form. John Carter’s story, retitled A Princess of Mars, appeared in October 1917. It concludes with John Carter returned suddenly to Earth, not knowing the fate of the princess of the book’s title, the “incomparable” Dejah Thoris. The story cried out for a sequel, and Burroughs obliged, publishing nine more novels set on Mars (called Barsoom by the planet’s inhabitants); John Carter figures prominently in the second and third books of the series—The Gods of Mars and The Warlord of Mars—so the groundwork has been laid for follow-ups to John Carter the movie should it prove a success. As for Burroughs, he moved from Chicago to Oak Park in 1914 (he owned houses at 414 Augusta Street and 700 Linden Avenue) and then decamped for the West Coast in January 1919. He bought a 540-acre ranch in the San Fernando Valley (modern-day Tarzana), covered the war in the Pacific after the attack on Pearl Harbor, and died in Encino on March 19, 1950 while reading the Sunday funnies. • For someone with no literary aspirations, Burroughs is certainly getting the high-brow treatment. The Pulitzer Prize–winner Michael Chabon—whose Gentlemen of the Road is á la Burroughs—gets a screenplay credit on John Carter, and next month, to celebrate its centennial, the esteemed Library of America will release A Princess of Mars, with an introduction by Junot Diaz, another Pulitzer-winning novelist. Finally, for a closer look at Burroughs, take a look at Irwin Porges’s Edgar Rice Burroughs: The Man Who Created Tarzan, a big, visual delight worthy of its subject.